15/2/03 – Pauline got up early to drop Sean at the rugby club in Virginia – his under-12 team had a match in Enniskillen. This was his first ever proper rugby match … He had a great time – they had in fact played two short matches, of which they won one and drew one. Sean had played first centre and second row. 29/3/03 – Sean had an under-12 match against Athboy, which we attended. He did well, but Athboy had a much better team and won comfortably. 27/4/03 – Virginia under-12s had a match in Athboy. Sean apparently had a good game and got a lot of praise for his tackling – his team lost by a try. 25/10/03 – Sean played a rugby match for Virginia under-14s in Cavan … the match was a 10–10 draw; he enjoyed it hugely. It was an 80-minute match on a full-sized pitch with full-sized goals. 26/10/03 – Sean had an under-12 match against Athboy in Virginia. He did extremely well and scored two tries – his first in competitive rugby. Even the opposition coach complimented him (and me for being his dad) after the match. He has a great attitude, does everything properly on the field and is a gentleman off it, chatting to opposing players and so on. 1/11/03 – Sean played an under-14 match in Newry. Virginia lost 35–14 but Sean scored a try. 15/11/03 – Sean had an away under-14 match in Lurgan … he scored a try as Virginia beat Lurgan, and was very pleased with himself. 22/11/03 – Sean had an under-14 match in Larne … his team lost 26–21 but, more importantly, three of the players were hurt when the jeep they were travelling in overturned on the way to Virginia this morning. 5/12/03 – Sean had an under-14 match in Armagh – his team won 36–0; he played full-back. 13/12/03 – We watched Sean play an under-12 match against Dundalk – his team were beaten, but Sean played very well and scored their only try, forcing his way over after a tapped penalty near the Dundalk line. 10/1/04 – Sean had a home under-14 match against Ballyclare. The match was very good – Virginia won 24–7. Sean was on the wing and out of the match a lot of the time, but did very well when called on. Ballyclare were dirty, and Sean was bitten on the shoulder. 17/1/04 – Sean had an under-12 match in Enniskillen … he scored two tries and set up his team’s third, but he was given rough treatment – punched in the face and elbowed. 23/1/04 – We watched Sean’s under-14 match against CIYMS – this degenerated into a farce in the second half, and was abandoned due to fighting with Virginia leading 27–0. CIYMS were a very poor and a very dirty side, and their coach seemed to be a head case. 1/2/04 – Sean had an under-12 match in Athboy – he scored three tries but his team lost 6–3 [on tries], having substituted everyone but himself and Simon at half-time. 14/2/04 – Sean had an under-14 match in Cavan – he had to stop playing after five minutes because of a thigh strain. 6/3/04 – Sean had an under-12 match in Cavan … he hurt his knee early in the match and had to go off, and Virginia lost. 21/3/04 – u12 match in Mullingar – Virginia lost, but Sean scored two tries. 28/3/04 – u12 match against Cavan – Cavan won fairly easily, as Virginia didn’t support each other properly and usually lost the ball when they took it into contact. However, Sean scored two tries, the second of which was particularly good. 3/4/04 – Patricia brought Sean to the rugby club for an under-12 match against Enniskillen … Sean ended up playing an under-14 match as well as the under-12 one, this time against Cavan. Malachy drove Sean home and said that he had done very well at full-back for the under-14s. They had had a big win; Sean had scored two tries for the under-12s but his team had lost. 16/4/04 – Malachy rang to ask Sean to play an under-14 match tomorrow; Pauline said that he would, and he then agreed. 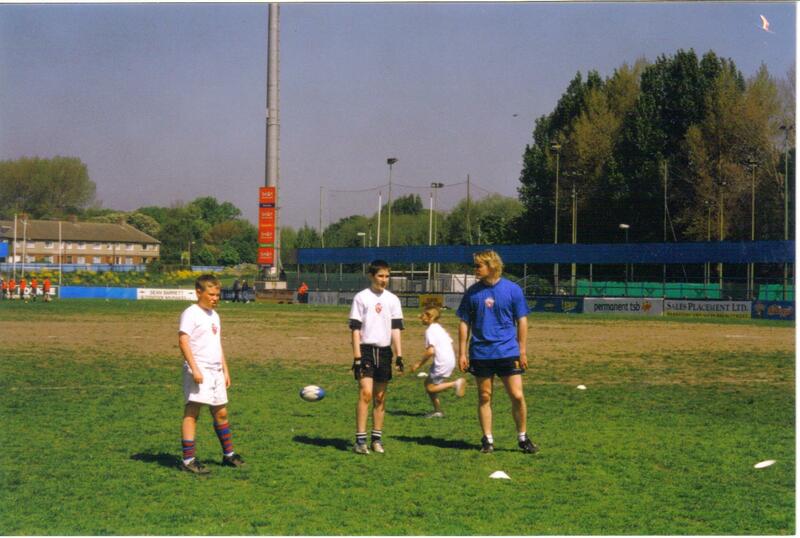 17/4/04 – I got up at 7.30 and called Sean for his rugby match. He was tired, and didn’t want to go. He was also in a foul mood. We said that he had to either go or ring Malachy; that he couldn’t just not show up. He said that he would go, with very bad grace, and I drove him to the rugby club. It was against Carrickfergus at a neutral venue somewhere up north – a semi-final. [We went to Dublin; when we got back …] Sean was at home already and in better mood, although his team had lost, he’d had a try wrongly disallowed and his day had generally been fairly miserable. 24/4/04 – I called Sean at 8 – he had an under-12 rugby blitz in Armagh; Patricia brought him to the club … Sean was gone for most of the day; Patricia dropped him home. He had had a wonderful day – he played several matches and scored six tries; he captained the Virginia team, which finished third out of 12 although they were missing most of their good players. He got a medal, and the organizer described him as the outstanding player of the tournament. Also, he met and chatted to Tyrone Howe, got his autograph, and got a photo of himself and Howe on his mobile phone. He was absolutely delighted with himself, quite rightly. 9/5/04 – Sean had an under-12 rugby match against Athboy … Sean played very well and scored the only Virginia try – his team were poor, and lost heavily. 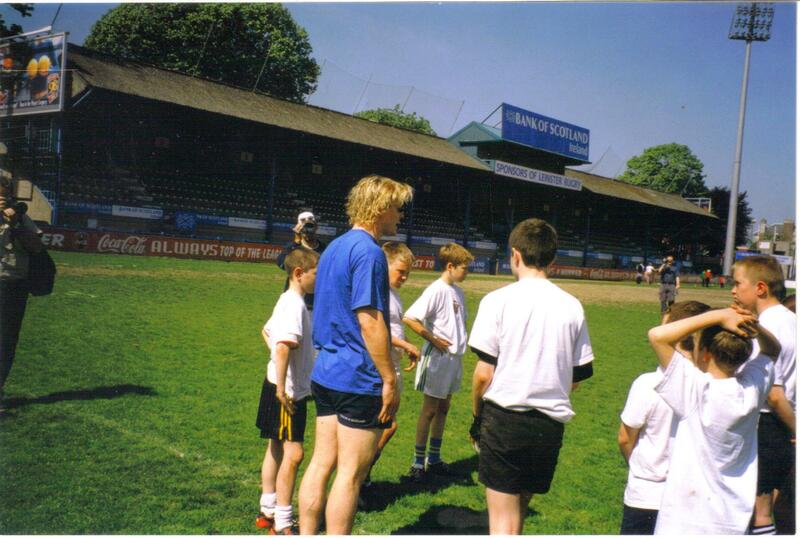 16/5/04 – Sean, Pauline and I headed off around 8.15, and picked up Simon in Virginia … [in Donnybrook, Dublin] we registered for the Brian O’Driscoll event … There were around 40 kids, who were divided into four groups. The groups rotated between coaches who instructed them in tackling, passing, evading tackles and kicking, with O’Driscoll going round and spending time with each group. It was a lot of fun for Sean and Simon, but marred by the fact that most of the kids were smaller (some very small), and most of them had little or no idea of how to play rugby. Presumably they had entered the competition just to meet Brian O’Driscoll … at the end of the session, O’Driscoll posed for group photos with the kids from each province, and Sean and Simon were the only two from Ulster. There was a long question-and-answer session with O’Driscoll, some food, and each kid was allowed to get one autograph. They all got a ‘goodie bag’ as well, with a fleece and so on. So, Sean and Simon (almost certainly the two best rugby players there) were well pleased.